Draw samples from a Pareto distribution with specified shape. 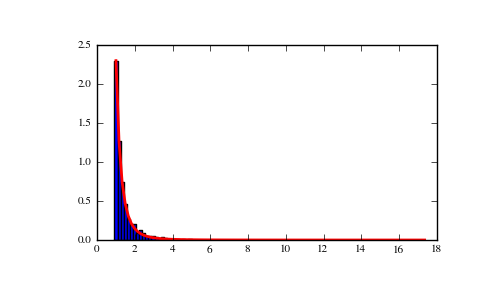 This is a simplified version of the Generalized Pareto distribution (available in SciPy), with the scale set to one and the location set to zero. Most authors default the location to one. The Pareto distribution must be greater than zero, and is unbounded above. It is also known as the “80-20 rule”. In this distribution, 80 percent of the weights are in the lowest 20 percent of the range, while the other 20 percent fill the remaining 80 percent of the range. shape : float, > 0. The Pareto distribution, named after the Italian economist Vilfredo Pareto, is a power law probability distribution useful in many real world problems. Outside the field of economics it is generally referred to as the Bradford distribution. Pareto developed the distribution to describe the distribution of wealth in an economy. It has also found use in insurance, web page access statistics, oil field sizes, and many other problems, including the download frequency for projects in Sourceforge . It is one of the so-called “fat-tailed” distributions. 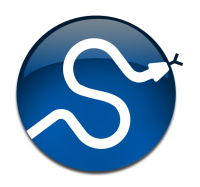 [R233] Francis Hunt and Paul Johnson, On the Pareto Distribution of Sourceforge projects. [R234] Pareto, V. (1896). Course of Political Economy. Lausanne. [R235] Reiss, R.D., Thomas, M.(2001), Statistical Analysis of Extreme Values, Birkhauser Verlag, Basel, pp 23-30.